COVINGTON, Georgia (November 15, 2017) “Change Or Get Left Behind” has been the mantra of Georgia-based Obsession Bows since it exploded on to the archery scene five years ago and the award-winning manufacturer does it again in 2018 with the new Fixation and Final Pro X bows. An all-new riser design for 2018 reduces bow flex during the draw cycle, enabling absolutely superior accuracy, while a new Anti-Torque Cable Rod reduces cam lean and torque. Both bows utilize Obsession’s Two-Track cam design (Patent No. 7997259) for an unmatched smooth draw. The Fixation produces IBO speeds up to a wicked fast 358 FPS and will be offered in both 6-inch and 7-inch brace heights and with either the M configuration for smooth-as-butter shooting or the XP for pin-your-ears-back speed and performance. “If speed is your goal then grab the Fixation 6XP and buckle up,” says Obsession Bows’ Dennis Lewis. “The XP models feature our DS Cam for awesome acceleration, while the M models utilize the proven DE Cam for exceptionally smooth shooting while giving up very little in speed.” The Fixation weighs in at 4.3 pounds, has a 32 1/4-inch axle-to-axle length and is available in draw lengths from 23.5-inches to 30-inches for the 6M and 6XP, 31-inches for the 7M and 7XP. MSRP for the Fixation is $999. Obsession’s newest target entry is the Final Pro X. With a 7 3/16-inch brace, axle-to-axle length of 38-inches and IBO speeds up to 330 FPS, the Final Pro X and its DE Cam is poised to consistently put shooters on the medal stand in 2018. It weighs in at 4.3 pounds and is available in draw lengths from 26.5-inches to 32-inches. MSRP is $1099. Field & Stream Magazine’s 2017 Gear of the Year pick for compound bow, the Obsession Turmoil, will feature the new Hybrid RZ Cam with Rotating Draw Mods which enable half-inch incremental changes in draw without the need for a bow press. “The Turmoil raised the bar on what is expected in a mid-priced bow and with speeds up to 350 FPS, the new Turmoil RZ is poised to blow the roof off those expectations,” proclaimed Lewis. The Turmoil RZ also features the new Anti-Torque Cable Rod and weighs in at 3.8 pounds. Additional specifications include a 6.5-inch brace, 33” axle-to-axle length and draw lengths from 24-inches to 30-inches. The Final Cut, Huracon, and Hemorrhage DE will all sport the new Anti-Torque Cable Rod as well. Obsession is excited to announce all-new color and decoration options for 2018. Hunters will be able to choose among standard options including patterns from Mossy Oak® like Original Bottomland™, Break-Up Country™, and Mountain Country™, plus Realtree® Edge™, Realtree AP Snow™, Kryptek® Highlander™ Kryptek Typhon™, Moonshine Camo® Muddy Girl™ and Stealth Black. A variety of standard target colors are also available and the popular Obsession Hashtag™ bow for youth and small-framed adults now has an attractive patriotic Stars & Stripes pattern available. 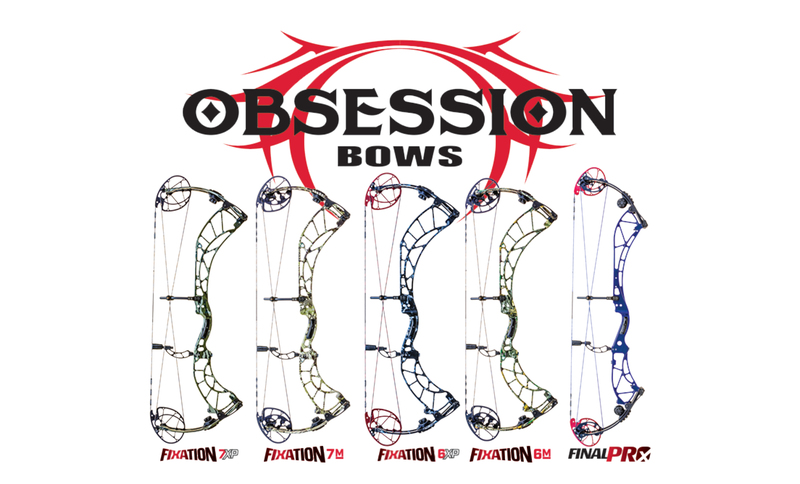 A broad variety of additional patterns, string colors and cam colors are available for 2018, making Obsession one of the most exciting custom bow producers in the country. See the full lineup of products from Trophy Taker in the Arcus Hunting booth #5433 at ATA, January 11-13, 2018.